Sarah Hall - The Pampered Chef: CHOCOLATE! Have had a fab time at Emma's Pampered Chef Chocolate show tonight! We made some really easy chocolate brownies that take minutes to whip up and some yummy scrummy rolo tarts! Emma had a great show and got double points now we are in August! She will be able to choose almost £100 of free products of all her own choice and I know she is very excited to be getting lots of lovely new things for her gorgeous new kitchen! 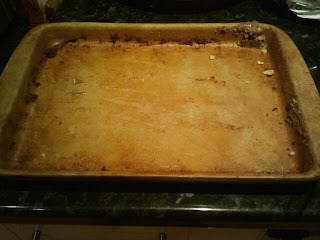 The brownies were made in the Medium Bar Pan which is a great piece of stone - ideal for all your things out of the freezer, baked camenberts, pizzas, flatbreads, tarts and pieces of meat and fish which stay delicious and succulent without the need for foil and oil. And the most amazing thing is that this is the Medium Bar Pan AFTER we took the brownies out! I didn't oil the stone before, but it has become so non-stick that I hardly need wash it! And here is the recipe....enjoy! * Preheat oven to 180°C / 350°F / gas 4. * Add sugar, egg, vanilla to batter bowl, mix well using Stainless Steel Whisk. * Spread mix evenly in Medium Bar Pan with Classic Scraper. * Bake for 15 – 18 minutes or until set in centre (do not over bake). other half of the walnuts.